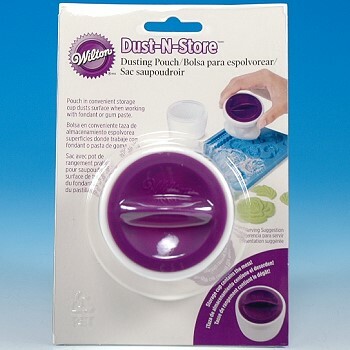 Dust-N-Store Dusting Pouch, makes it easy to keep fondant or gum paste from sticking to your work surface or tools with a light dusting of cornstarch or confectioners' sugar. Powdered sugar or cornstarch is contained within the food-safe fabric pouch. When your finished dusting, replace the pouch into the cup and any excess dust is contained securely in the storage container. 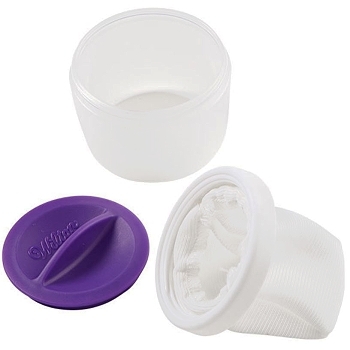 • Easy to Fill: twist off the purple lid. Fill pouch with cornstarch or confectioners' sugar. Twist lid on cup to close. • Easy to Use: twist off larger white ring from cup. Tap pouch lightly on your work surface or tools to dispense cornstarch or sugar. • Easy to store, mess-free: replace pouch in cup and twist closed for easy storage.